The Japan Golf Goods Association today announced that it would support the distribution of non-conforming golf equipment. 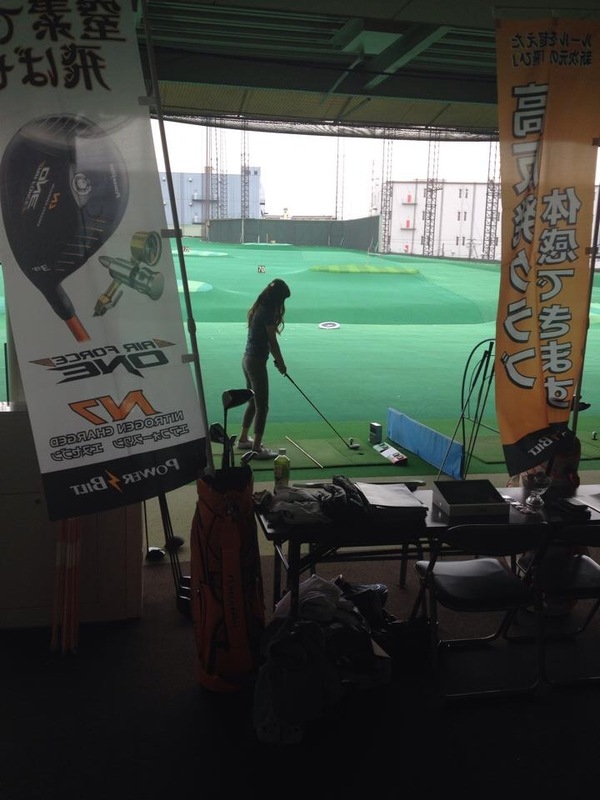 The Japan Golf Goods Association, the trade organization for golf equipment manufacturers in Japan, today announced that it would support the distribution of non-conforming golf equipment. “JGGA believes that it is desirable for the stimulation of the golf market to have a wide variety of golf equipment available in the market from which all types of golfers may choose in order to find one that really fits their respective purposes and needs, hoping that more and more golfers will enjoy playing golf as a result of such improvement in the golf equipment market,” an English translation of the JGGA statement reads. A recent study by Golf Datatech and Yano Research Institute of Japan, the world’s two leading organizations studying the global golf retail market space, Japan is the No. 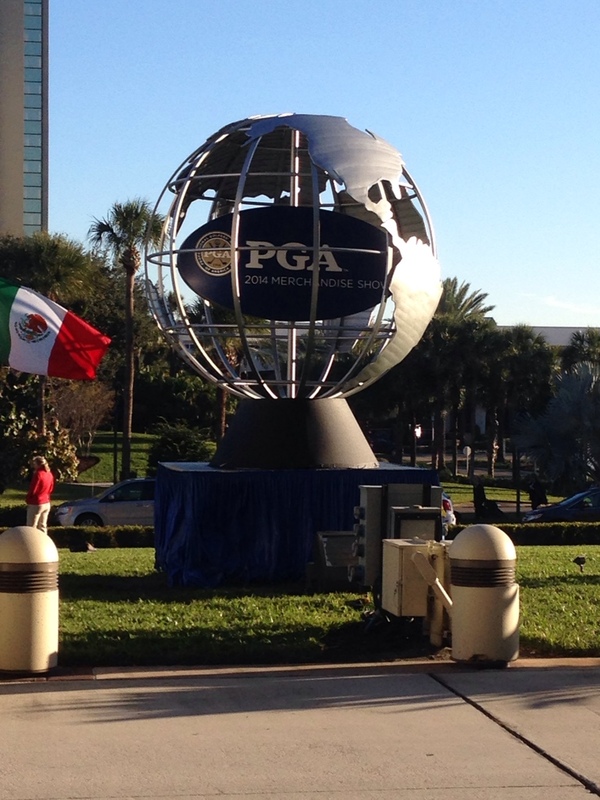 2 country in golf sales in the world with 24 percent of the global golf market. The JGGA sponsors the Japan Golf Fair, Japan’s version of the PGA Merchandise Show, which will be held Feb. 13-15 in Tokyo. ORLANDO, Fla., September 22, 2014 … Golf Datatech, LLC (golfdatatech.com), the golf industry’s leading independent research firm for consumer, trade and retail golf trends, today released the results of the Women In Golf 2014 Study; a comprehensive study of the playing and purchasing habits of the serious female golfer. Today, female golfers make up more than 20% of the estimated 25 million golfers in the U.S., and approximately 19% of all golf sales nationally. The Women In Golf 2014 Study explores a range of topics about the $900 million women’s golf equipment/apparel market, while discovering valuable insights about the playing habits, opinions and preferences of golf’s most underserved market. The study also focuses on women golfers’ attitudes about the game and the facilities they play, revealing deep insights into their attitudes about equipment and brand choices, as well as their purchasing habits. Further, the study uncovers how women golfers’ media preferences and use of social media differ greatly from men. The 300+ page study’s results are based on responses from nearly 2,000 female golfers drawn from Golf Datatech’s exclusive Serious Golfer Database. These individuals average 60 rounds per year, while also actively participating in other activities, including walking, exercising, swimming, cycling, etc. Additional key findings of the study are that female golfers under the age of 40 are more likely to use golf as a valuable business resource. Among the three biggest positive attributes for playing the game, 90% cited general well-being (outdoors, exercise), 80% cited the challenge and competition of golf, and nearly 70% cited the social interactions of playing the game with family and friends. In contrast, when asked what they don’t like about the game, a majority of respondents cited that the average golf course is a very “male dominated” place. For more information on the Women In Golf 2014 Study, or to order the study, call 888-944-4116 or visit golfdatatech.com. 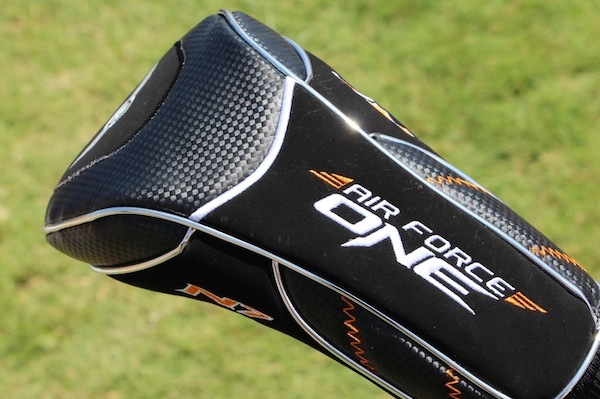 Summary: This AFO DFX Tour Black produces some of the fastest, most consistent ball speeds we’ve ever seen. 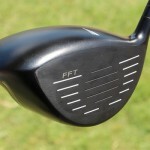 Pros: The Powerbilt AFO DFX Tour Black driver offers some of the fastest ball speeds and most consistent smash factors we’ve seen in testing, all in a deep-faced design that frames the ball quite nicely. In addition, Powerbilt offers stock shafts (no upcharge) from Aldila, Fujikura and Graphite Design. Cons: The lack of adjustability and name recognition in the marketplace make it difficult to establish immediate credibility. 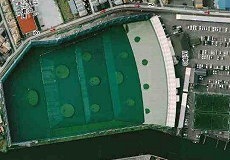 As such, many big box stores and green grass accounts may not have demo clubs available for potential customers to try. 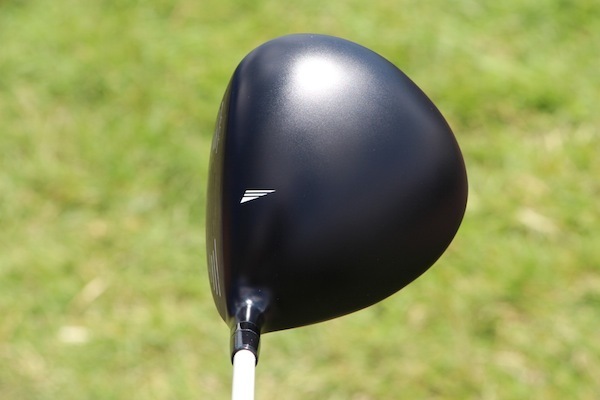 Takeaway: If you are more concerned about performance than a brand name and you don’t mind a non-adjustable head, this driver is extremely fast and forgiving. With an MSRP of $299, the increase in ball speed comes at a great value. OEM’s are chasing the holy grail of drivers more than ever before. 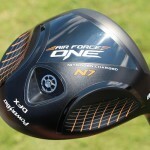 At the same time, consumers want the “one arrow quiver” in the form of a driver that gives them both maximum distance and maximum forgiveness. 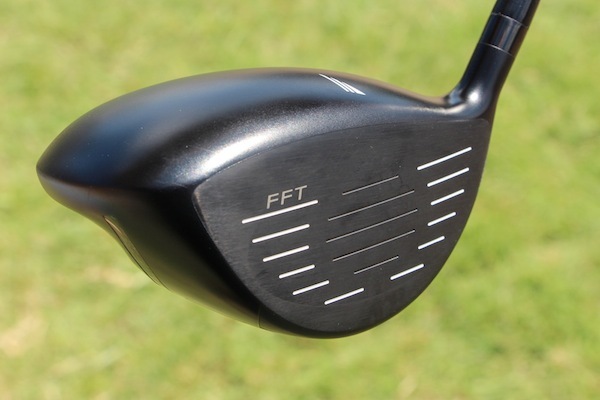 To that end, Powerbilt, which hasn’t exactly been a major player in the premium driver market, is reintroducing itself with the 2014 AFO DFX Tour Black Driver. 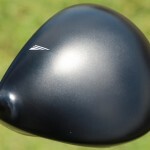 This driver, which features a glued (non-adjustable) head is offered in lofts of 8.5, 9.5, 10.5 and 12.5 degrees. The 8.5 and 9.5 degree models are currently right-hand only. Stock length for this club is 45.5 inches and swing weight as tested was D5. Stock (no upcharge) shafts include the Graphite Design G-Series, Fujikura Fuel, Fujikura Motore F3, Aldila NVS and Aldila RIP Beta. Custom shafts from Oban and Mitsubishi are available for an upcharge as well. MSRP for this club is $299. 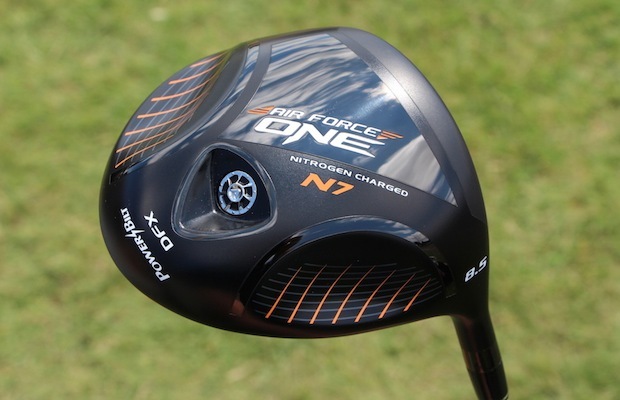 The differentiating feature of this club is Powerbilt’s patented “Nitrogen Charged” technology, a.ka. 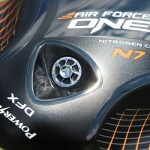 Nitrogen N7. According to Powerbilt CEO Ross Kvinge, the goal was to “harness the nitrogen” and provide a driver with the classic aesthetics (deep face, rounded profile), which has been the calling card for the company since its 1916 inception. 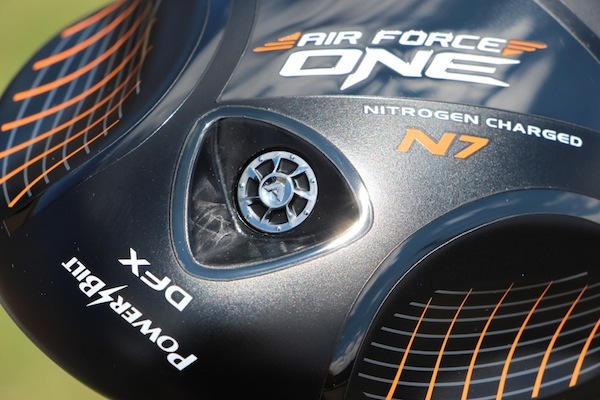 Effectively, 80 PSI of compressed nitrogen (the company did play around with nitrogen levels as high as 150 PSI) is added behind the face of the club in an effort to reinforce the entire face in a manner that is unprecedented in the industry and conforms to all established rules of golf. 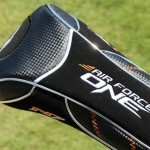 Powerbilt touts this weightless technology as paramount in creating a club which offers maximum C.O.R. and consistently extreme ball speeds and smash factor. I’m not sure if it’s the Nitrogen technology, lightening bolt emblem or warm California sun, but this supercharged driver isn’t afraid to go deep and play all day. Over….and over…and over….It was like I was hitting “rinse and repeat” all day long. Once I was able to dial in my swing, I was hitting mid-trajectory bombs that peaked, never ballooned and consistently exhibited decent angles in the low 40-degree range. Nearly ideal. With the Oban Kiyoshi White, the club displayed a mid launch, mid spin, long carry and it hit the ground like it was being chased. What’s more, the shot shape was remarkably predictable and I could rely on a little butter cut fade on literally every tee ball. Honestly, given some of the past informercials, I was concerned. However, after a small bucket, my concerns were entirely alleviated and were as far gone as the the last range ball I hit into our maintenance shed, which was a 290-yard carry. On several dog-leg left holes, I did struggle to turn the club over. That being said, my big miss is the “left-going-more-left” tee ball and frankly, I can’t hit that shot consistently anyway. The dispersion, however, was as good if not better than other comparable clubs. 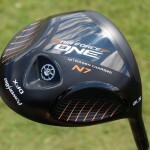 Again, I have to give credit to the N7 technology, which apparently means you are going to hit the ball longer and straighter than pretty much every other driver out there. My typical miss is a high block and while there isn’t a tour-quality driver in the world that can save me from this shot, slight mishits were penalized ever so slightly and I noticed minimal loss in distance and direction with the AFO DFX Tour Black. 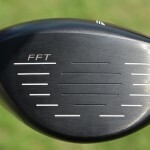 The head itself is a mid-launch and mid-spin design, and given the plethora of shaft options you could certainly tweak this head a bit in either direction. However, if you are a player who absolutely needs super low spin, there are lower-spinning options out there at similar price points. 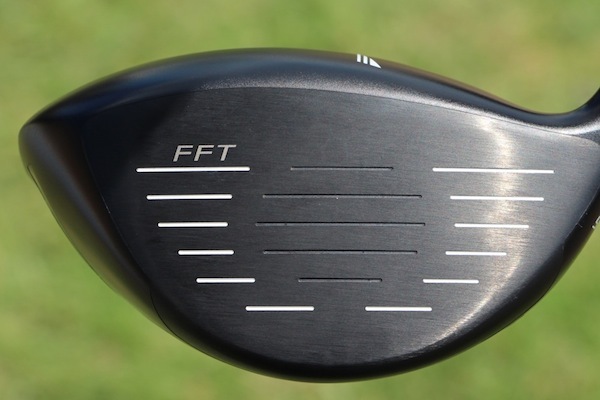 But you’ll likely give up some ball speed in the switch, as the AFO DFX Tour Black created some of the highest ball speeds and smash factors I’ve seen in testing on shots hit across the face. The aesthetics of the DFX are all business. Serious business. 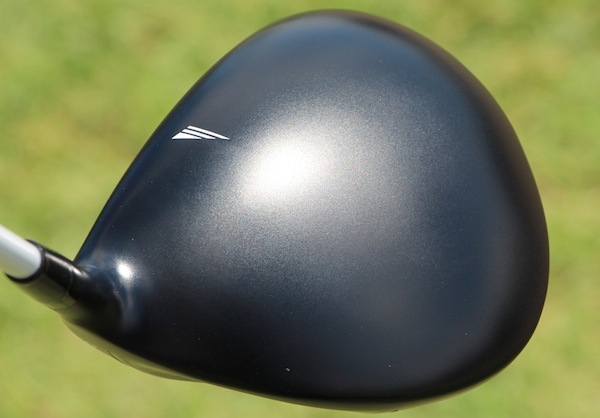 The matte black crown flows nicely into the deep black face with the only deviation being a white alignment aid atop the pear-shaped profile. The rear of the club is slightly pointed and the sole of the club has aerodynamic shaping, orange accents and plenty of words and letters to remind you what brand/model you’re bagging. 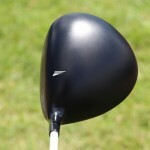 Overall, the head shape is nice and compact and doesn’t appear or play bulky or cumbersome. Its appearance at address, aside from the alignment aide, which looks cheap and lacks symbolic presence, is pleasing to even the most discerning players. It’s been stated that sound creates feel. In that case, this club really hums. Or sings. Literally. At first I had no idea what to expect hitting a club reinforced with nitrogen, but the sound was uniquely different. It wasn’t loud or obnoxious, but more like hitting something that was part golf club and part tuning fork. The sound isn’t an accident. In point of fact, it’s engineered. Sound waves are provided exit channels prior to compression to create a specific sound and feel. I can’t say I was adverse to it, but it was a far cry from persimmon. I guess the best description is that the feel is a taste acquired slowly over time. 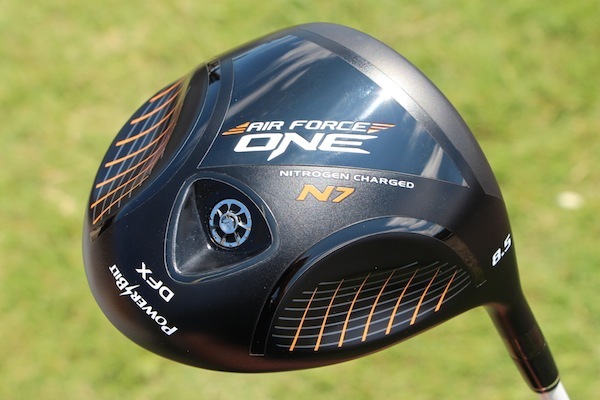 Powerbilt’s new AFO DFX Tour is a high-performing, distance-eating monster of a driver. The access to high-end stock and upgraded shafts is reason enough to buy the club. 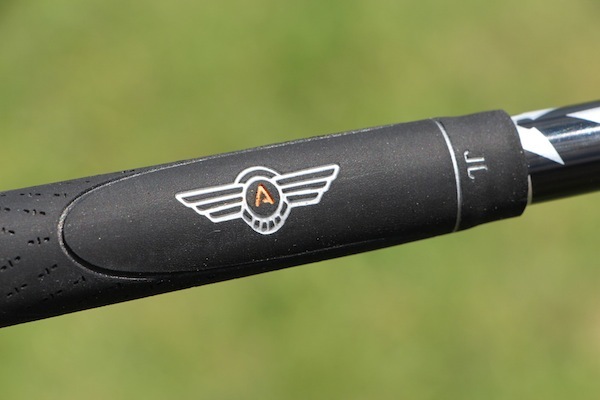 That said, the lack of adjustability and minimal name recognition provide a significant barrier to getting potential customers to try the club. 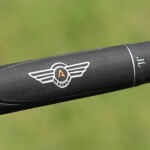 Powerbilt is a small fish in a ginormous sea, working its way into premium golf clubs and the AFO DFX Tour is just that: Premium. Powerbilt has put in the time, effort and engineering to create a technology that CEO Ross Kvinge asserts will allow them “to stay pretty true to who we are.” From what I can tell, this is a company moving in an exciting and performance-oriented direction and I wouldn’t be surprised to see Powerbilt on some higher profile professional tours in the near future based on the performance of this club. Powerbilt’s mantra “change your game” and unprecedented use of nitrogen is slightly edgy and quite risky, largely because it has to be. The consumer driver market is ultra competitive and there is an abundance of quality choices. As such, Powerbilt is certainly willing to put itself out there and is banking on something that is colorless, weightless and odorless to make a lot of noise. Be careful, it just might be where driver technology is headed. Wouldn’t it be something is Powerbilt got there first? 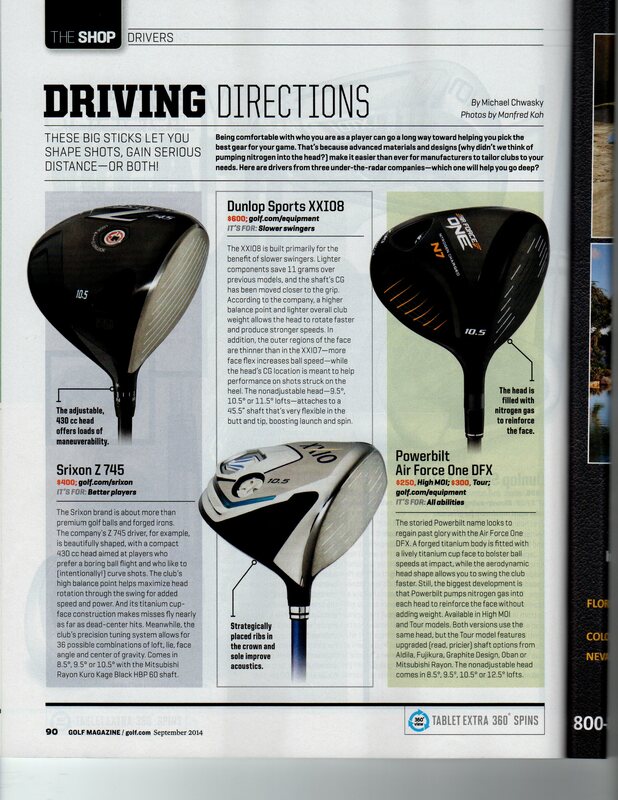 Click here to learn more about the AFO DFX Tour Black Driver on Powerbilt’s website. 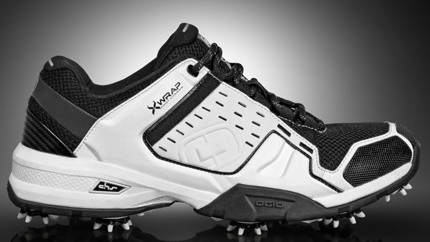 Ogio will launch footwear to complement its apparel line that has been a big hit internationally. Its foursome of models–the Race, City Spiked, City Turf and Sport–trade off the company’s reputation for sturdy, stylish products. 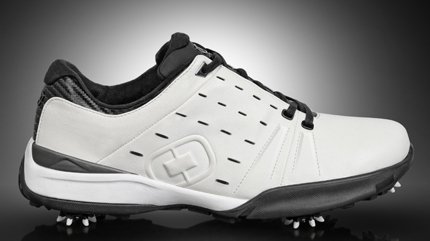 All four feature the company’s Synkfit insole, which quickly molds to a golfer’s foot and aims to minimize movement inside the shoe. The top-of-the-line Race ($170) stands out with its leather outsole and ventilation system to keep the foot from overheating. 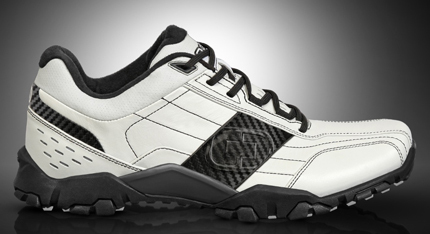 It’s also designed with a wide-toe area for increased comfort and stability. 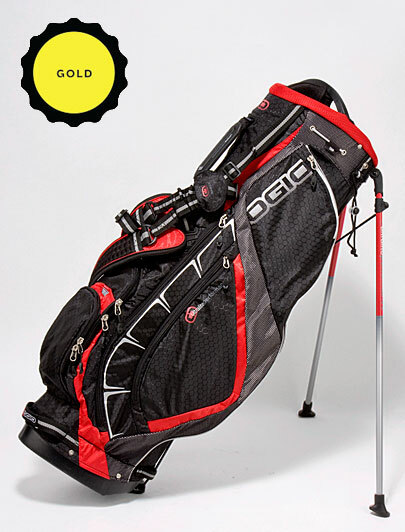 TECH TALK:The 4.4-pound carry bag is among the lightest in Ogio’s history. The bag’s suspension strap system is intended to make it seem even lighter than it is, and the thin, ventilated air straps are designed to increase comfort by allowing body heat to escape and cooler air to flow in. A molded handle on top of the golf bag conveniently separates woods from irons. assets, and the expansion of the North America apparel license. 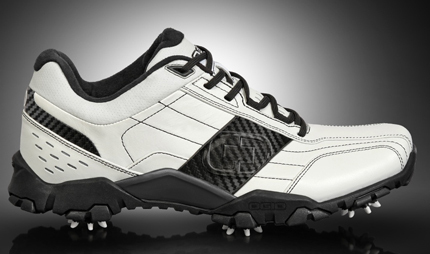 Putter, which launched during the second quarter of 2012. Gross margins were up 30 basis points to 43.6 percent of net sales. irons compared to the successful launch of the RAZR-X irons last year. the second quarter rather than the first quarter last year. due to increases in packaged club sets and apparel. sales for the quarter were $135.4 million, a decline of 3.4 percent. Asia, partially offset by a 12 percent increase in Japan sales.